Check out this neat break-and-retest setup forming on NZD/USD’s 1-hour forex time frame! The pair recently made a strong break below support around the .6650 minor psychological level then dipped to the .6500 mark before pulling up. Using the handy-dandy Fib tool on the latest swing high and low shows that the 61.8% Fibonacci retracement level lines up with the broken support, which might now hold as resistance. In addition, this coincides with the 200 SMA, which has held as a dynamic inflection point in the past. The 100 SMA is still below the 200 SMA anyway, indicating that the selloff could resume sooner or later. 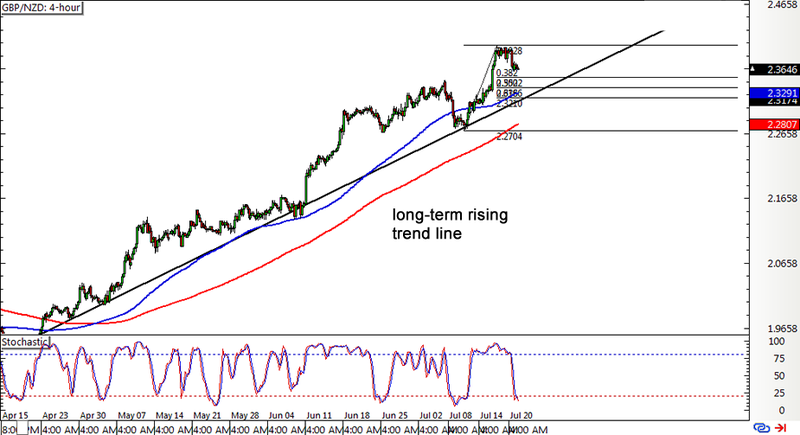 Stochastic is moving up but is approaching the overbought zone so Kiwi buyers might need to take a break in a bit. Careful, Kiwi bears! 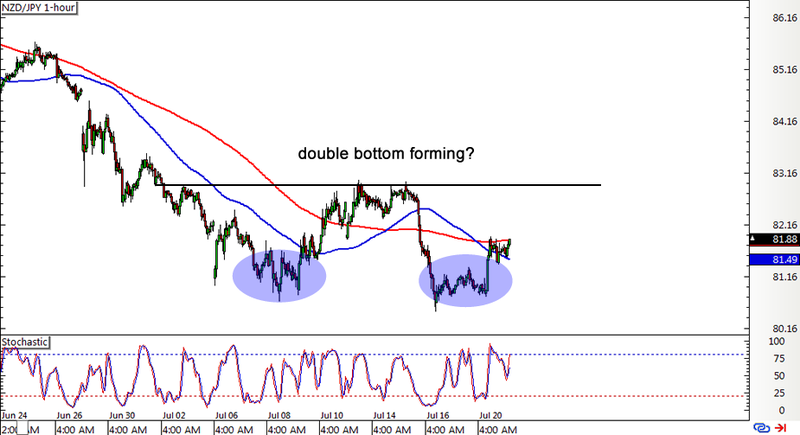 NZD/JPY seems to be tired from its recent dive, as the pair is starting to form a double bottom reversal pattern on its 1-hour forex chart. The pair failed in its last two attempts to make a strong break below the 81.00 major psychological support and might be on its way to test the neckline around the 83.00 handle. 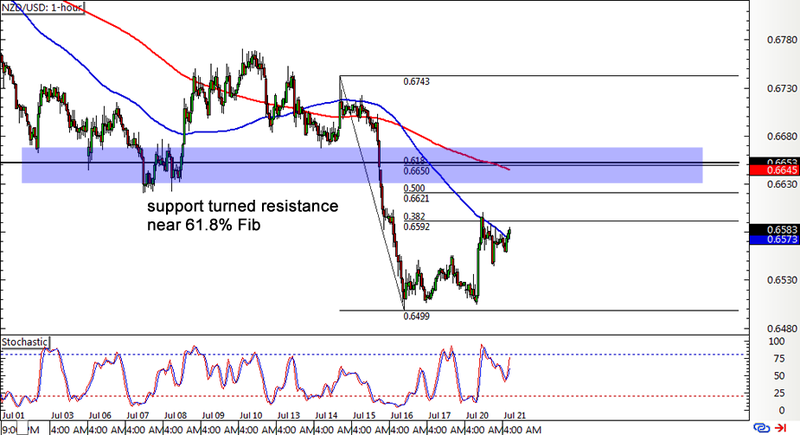 A break above this resistance could confirm that further gains are in the cards, possibly leading to a rally of around 200 pips or the same height as the chart formation. For now, price is stalling around the moving averages which are suggesting that the path of least resistance is to the downside. Stochastic is also near the overbought territory, which means that sellers might be ready to step up their game and push for new lows later on. Think the trend is your friend? Then you should watch this long-term rising trend line forex setup on GBP/NZD’s 4-hour time frame. The pair seems to be having trouble surging past the 2.4000 major psychological resistance and might need to draw more pound bulls to the mix. Price looks ready to pull back to the rising trend line, which is around the 100 SMA dynamic support level and the Fibs. Stochastic is almost in the oversold area, which suggests that the retracement might be shallow and that price could bounce off the 2.3000 levels then resume its climb past the recent highs. However, if sellers take over, a break below the 2.3000 major psychological support could signal that a reversal is underway.